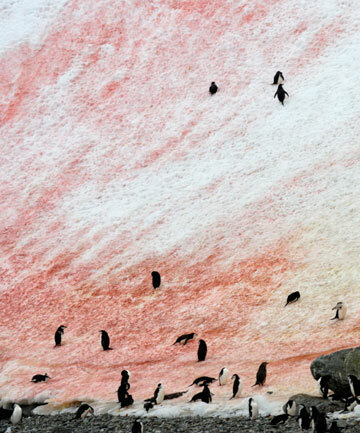 You know all about the green and blue algae that grows in the ocean, but what about the hot pink algae that thrives in frigid climates? It sounds like something straight out of a cartoon but nature is lit, kids, and snow algae is 100% real. You'll find this cosmic-looking algae, nicknamed "watermelon snow," growing on ice caps and mountain tops, particularly in the alpine and polar regions. Interestingly, snow algae grows green in the warm months but once temperatures lower, it turns pink — via red carotenoid pigment — as a defense mechanism against harsh UV rays. Its unique makeup makes it a surprisingly beneficial skin care ingredient. Specifically, snow algae increases hydration in the skin for a more supple complexion, boosts collagen production for improved texture and appearance, and protects skin from environmental damage at a cellular level. A handful of brands already use snow algae in their formulations, so if you're interested in trying the ingredient out for yourself then start here.